Now that I’m a grandpa, I’m on the look out for great kids’ books. We’ve still got a few at home that our kids haven’t taken with them, but we’re keen for some new ones for when the grandkids come to visit. So I was pleased when the The Good Book Company sent me a new children’s book to review. It’s The Friend who Forgives: A True Story about how Peter Failed and Jesus Forgave, written by Dan DeWitt and illustrated by Catalina Echeverri. Firstly, this is a beautiful book. The pictures are captivating—not just for kids, but adults too. They are lively, funny, colourful, and expressive. And the words, too. They’re written in a clear, simple, conversational style, that works for adults and children. The listener is drawn in with the occasional question. And most importantly, it’s beautifully theological. It introduces the readers and listeners to the wonder of Jesus’ forgiveness. We tested the book yesterday with our nearly five year old grandson. He’s not reading yet so Nona read it to him. He listened intently, answering appropriately, and told me he enjoyed it at the end. We’ll read it to him again, next time he comes over. But this is a review and not the ramblings of a grandpa. I need to mention the inside back cover. It helpfully reminds the readers that this is a ‘tale that tells the truth’. DeWitt explains that this story is taken from the New Testament Gospels. This is God’s revealed will. It’s anchored in history and it has significance for us. I think it would be worth reading the account from an easy-to-read Bible with the children from time to time, so they make the connection with the Scriptures. I do have one concern about this book. It uses the words ‘forgive’, ‘forgave’, ‘forgiven’, ‘forgiveness’ without giving an explanation of what the word means. Not all words need explanation, but I think this one does. It’s central to the book and our grandson couldn’t tell us what it meant. When we thought about it, we realised that it is a difficult word to define simply. I recommend that you work out a simple explanation of forgiveness to share with the children who read this or have it read to them. Perhaps, you can think of an example or two they will quickly understand or identify with. Maybe, the author could add another page at the start or back, with a ‘For the reader’ section, defining and describing forgiveness. For now, why don’t you make a comment or suggestion on this post. How would you explain forgiveness to a five year old? From time to time in recent years I have written of our movement through the stages of life—the marked changes that occur from time to time in our health, or work, or the circumstances that shape the course of our life. This week there has occurred another change; this one effectively marking the end of an era in my life. In fact, the era of which I write is almost as long as my life. I write, of course, of my caravan experiences which have been brought to a close by the sale of our caravan of the last ten years. I do not remember the beginning of my life with caravans but a photograph of my brother, Graeme, and me indicates that those first experiences began before I was four years old. The first caravan was a home-made foldaway unit built onto a trailer by my father. Towed behind our 1928 Chrysler Royal motor car, it was the pre-cursor of today’s Camper Trailer. Its facilities were the most basic and our caravan park was but a clearing in the bush or a space among the dunes beside the sea. I know not how we fitted into the caravan or how we would have fared in the inclement weather which surely came our way from time to time. My memories of this early period are sparse, but they mark the beginning of a life time of holidays in which we took our home with us behind the car. In the late 1940s, “after the war”, my father purchased the first of several caravans which would become the base of family holidays over many years. Each one of plywood construction, each slightly larger and having a little more comfort and convenience than the previous one, they enabled us to travel further afield. The cars changed, too. The Chrysler was replaced by a 1934 Plymouth Fluid Drive, which I later purchased as my first car and re-named ‘Esmerelda’. Then in 1953 came Dad’s first new car, the Ford Customline. Our holidays took us to many parts of Victoria—along the coast east and west of Melbourne, to inland cities and towns and along the Murray River. Interstate and around Australia caravanning was still in the future for most people. For us, Victoria had much to offer and we returned often to the beaches and surf and the forest country along The Great Ocean Road. The second phase of the caravan experience is easy to identify. It began on 25 February 1961 when Ruth and I set off on our honeymoon, driving the Customline and towing the streamlined ‘Don’ caravan. It began dramatically when a shattered windscreen on our second day prevented us reaching our intended destination. The only parking available was at the local football ground, and the only facilities were the open-to-the-skies change rooms and their cold showers. Although this was not Ruth’s introduction to the caravan, as she had accompanied our family on several occasions, it surely was a cool introduction to marriage. That journey took us along the unsealed Princes Highway through Gippsland and the NSW south coast to Sydney and Palm Beach where we spent an idyllic week near the Barrenjoey Lighthouse with views to both Pittwater and the Pacific Ocean. Our return was via Canberra where we spent several days exploring the still young National Capital, little knowing that fourteen years later it would become the home for our family during a very significant period of our lives. Coincidentally, exploring the centre of Canberra known as Civic, we happened on a Canberra Day event—the commissioning of the new Ethos Fountain in Civic Square. For several years, family holidays followed a familiar pattern. Travelling from Tasmania (King Island or Longford) to the mainland, we would borrow car and caravan and head for such places as Echuca or Mildura, Philip Island or Western Victoria. Thus another generation of McDonalds was being introduced to the caravan experience. Eventually, it was time for phase three. In 1970, whilst at Longford, we purchased from a Launceston caravan hire business, which had fallen on hard times, our own caravan, a heavy 16 feet long, 8 feet wide Millard with high flat roof. With caravan in tow behind our HR Holden station-wagon, canvas annexe and stretcher beds for the children, many accessories stowed away, and three children in the back seat, we visited much of Tasmania and enjoyed many summer holidays near the sand dunes and beaches of St Helens. They were happy days. There was one near disaster with that caravan. On 5 January 1975, we left our Launceston home for the last time, to travel to Devonport where the ferry, Empress of Australia, would take us to Melbourne for some holiday time before travelling on to Canberra and the Reid Methodist Church. A tyre on the heavily-laden caravan blew out just a short distance from Launceston and without a replacement tyre we could not continue. It was Sunday afternoon and shops and garages in Tasmania were not open for business. Eventually we found the owner of a small garage who was able to open his workshop and fit a replacement tyre for us. Resuming our journey, the caravan was wandering a bit behind the car. A policeman stopped us, commented on the erratic driving, warned us to take care and allowed us to continue. We arrived at Devonport just in time to be the last vehicle to join the ferry, but too late to enjoy the picnic with the many friends who had travelled to Devonport to farewell us. One of those friends noticed that the replacement tyre did not match its partner. Sadly, a real disaster occurred that night, just a few hours into our Bass Strait crossing. News travelled through the ferry that the bulk ore ship Lake Illawarra, had collided with the Tasman Bridge, linking western and eastern shores of the Derwent River at Hobart, sinking immediately and causing a major portion of the bridge to fall. Many lives were lost and the life of the City of Hobart and its citizens was affected for long time. That date is deeply etched in our memory. Now mainland residents, our family holidays and occasional travels took us further afield. The summer family holiday was always at the coast—Pambula Beach, Bateau Bay, and Nambucca Heads. After ten years, it was time to replace the Millard which, though very spacious, had felt somewhat like a brick wall being towed behind the car. We replaced it with a lower-profile Viscount pop-top. Later again, the Viscount gave way to a Golf pop-top. With these lighter vans we not only continued our summer holiday bookings, but travelled throughout NSW, learning much of the history and geography, and building a photographic record that now fills many albums. These caravans were frequently our home as occasionally we crossed borders into Queensland or South Australia, or travelled by various routes to Melbourne to visit family and friends. In 2004, it was farewell to the Golf and welcome to our first ‘new’ caravan, a Jayco Heritage pop-top. The government’s pension bonus and an extraordinarily generous trade-in on the Golf enabled us to up-grade just one more time. (The story of that purchase is itself remarkable and may become the subject of some later writing.) No longer was there need of space for family members, though the beachside holiday tradition continued at Shoal Bay on Port Stephens; and visitors were always welcomed. There were dreams of travelling further afield, including particularly the Flinders Ranges and other parts of South Australia, but some health issues for both Ruth and me, and other circumstances caused the postponement, and eventually, the setting aside of those dreams. In recent years, the caravan travelled less, but in fact was used more. It was the occasional extra bedroom if the number of visitors stretched beyond the resources of our small home at Valley Heights. It was a private space where Norman would meet and talk with colleagues or people who sought his counsel. It was the prayer room for many years where Ruth met regularly and prayed with several women in our community. The realization that we would not use the caravan again for holiday or travelling was hard to accept and our initial attempts to sell were unsuccessful; so the caravan came with us to our new home. The night and day after our arrival here, the area experienced a ‘one in one hundred year’ storm with much local damage. The caravan suffered serious water damage, via a broken seal in the roof. Repair work has taken many months, covered by insurance, and now the caravan has passed to a new owner. For the writer, the caravan experience era has spanned a lifetime; for Ruth it has been a part of our life together. For me, it is an experience I have embraced with joy and enthusiasm; for Ruth, probably less so as the caravan still carries with it many of the familiar duties of domestic life. It just puts them in a more confined space. But the caravans have enabled us and our families to enjoy holidays that would not otherwise have been possible, to tour and visit parts of our country we would not otherwise have seen and to enjoy a freedom that is different from that of many holiday environments. Perhaps for Ruth and me it is the end of an era. Family holidays have found different expressions in the next generation. Heather and her family enjoy the Canadian cottage by the lake. Stephen and his family enjoy erecting their tents in remote places. The caravan experience lives on as David and Fiona and their family have continued to enjoy the sand and surf of the coast, as well as exploring the vast outback of Australia on their several safaris. 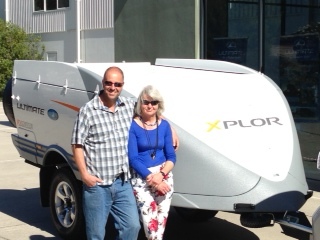 Their Ultimate Xplor Camper is more directly a descendent of the home-built fold-away caravan with which I was introduced to the caravan experience. Perhaps the era of the McDonald caravan experience has not ended, after all.